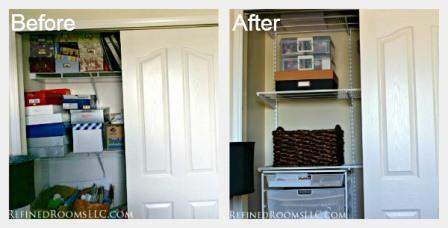 True confession time…I have a few areas in my own home that are in desperate need of an organizing makeover. Ever heard the saying about the cobbler’s children who have no shoes? Sometimes this adage holds true for professional organizers as well! One of my resolutions for this year is to set aside time in my schedule to revamp these spaces. 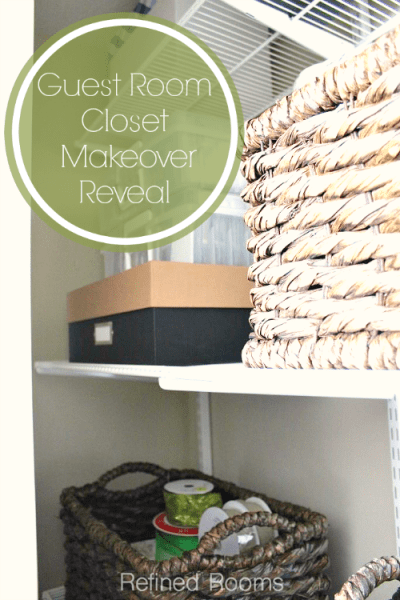 I shared in my last post that I recently took advantage of the Container Store’s annual Elfa shelving sale in January and completed the first project – the guest room closet makeover. 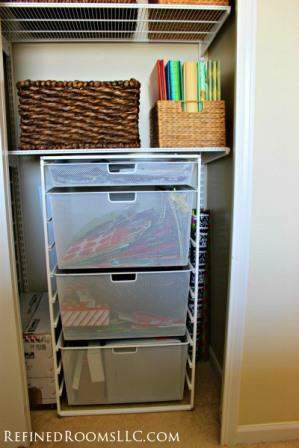 This closet serves as a storage area for gift wrapping supplies, photos, scrapbooks, fabric, sewing machine/supplies, and empty shopping bags. I rarely need access to these things, but when I do need to retrieve something, I usually end up uttering a few choice curse words as I sift through the closet contents. During the makeover process, I followed the same steps that I do with every client I work with, beginning with assessing the space. 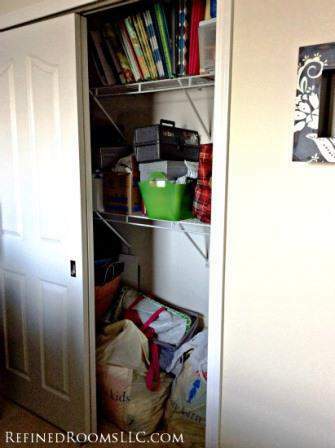 As you can see in the top photo, it’s quite clear that storing items on the floor is not working. 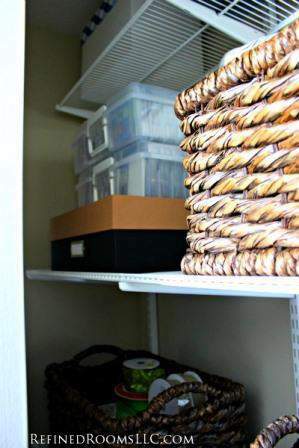 My new storage system needed to take full advantage of the vertical space in the closet. I determined that the best solution for my specific storage needs would be a set of freestanding deep drawers for each side of the closet. I also decided to change out the stationary shelving and replace it with a track shelving system. 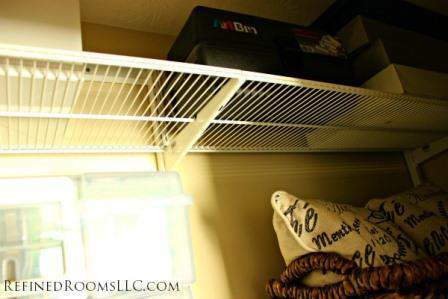 In addition to giving me the benefit of adjustable shelf height, the track system would allow for the addition of a third shelf to be installed at the top of the closet to store smaller, lighter items. 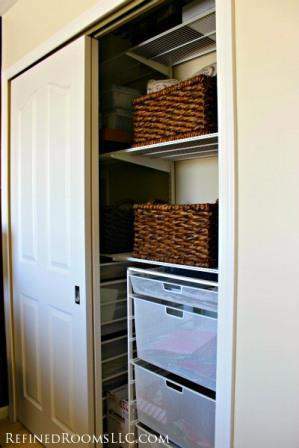 The Container Store has an awesome online closet design tool that I used to complete my design. Once you complete your design, the site will create an itemized list of all of the components that you need. Then all you have to do is place these items in your online cart and order. 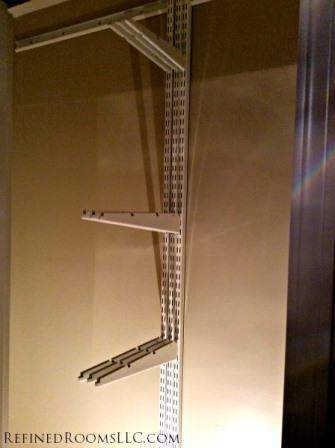 You can choose to have the closet system shipped to you, or pick it up at a local retail store. 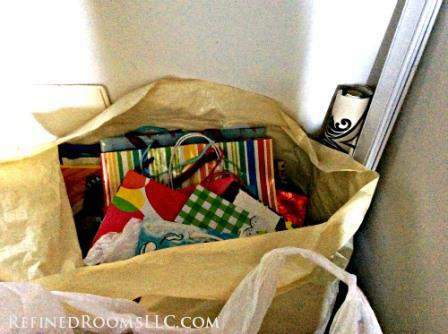 Do you see that horizontal piece at the top of the closet? It’s called the top track, and one of the awesome features of the Elfa easy hang system is that this is the only piece that attaches to your wall. Fewer holes in your wall is always a good thing. What was once my least favorite closet is currently my most favorite. I go in there several times a day and open the drawers to admire the perfectly organized contents! 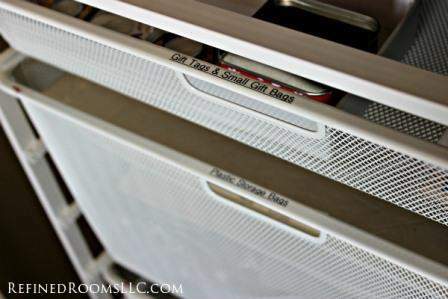 Above is a close up of the amazing drawer system. Elfa drawers can either be attached to the track or set up as part of a freestanding system. I chose the freestanding systems, since they allowed for the wider and deeper drawer size that my project required. Let’s take a look inside those drawers, shall we? 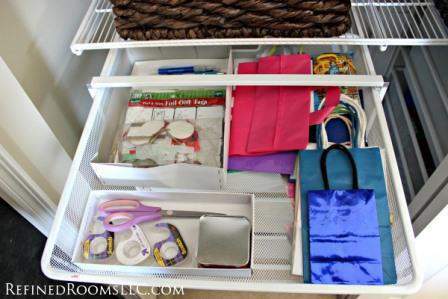 This is one of the two shallow top drawers, which contain small gift bags, wrapping supplies and tissue paper. 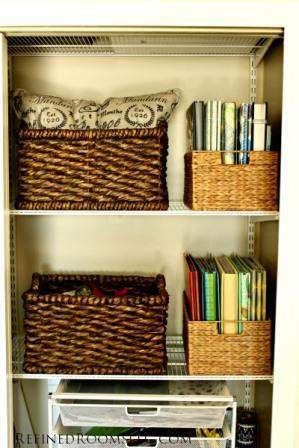 The lower shelves are used to store my scrapbooks, photos, and unfinished projects. 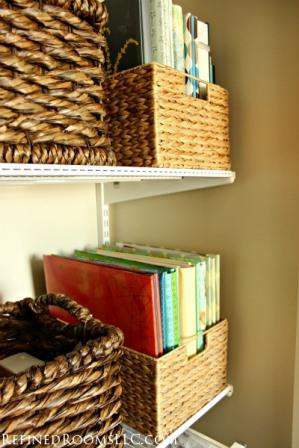 I love the addition of the storage baskets for corralling those scrapbooks! The left side houses my print photo collection. There’s another basket that contains gift wrapping ribbon. 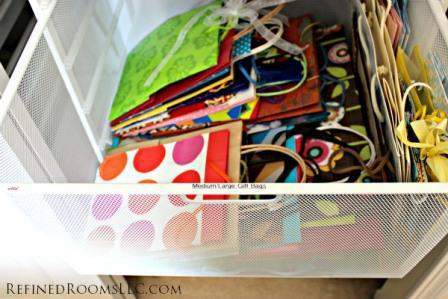 Inspired to tackle your own closet organizing project? The Container Store typically runs their annual Elfa sale in January and September each year. They offer 30% off of both the Elfa components AND installation services. So those are great times to schedule in your project on the home improvement calendar. 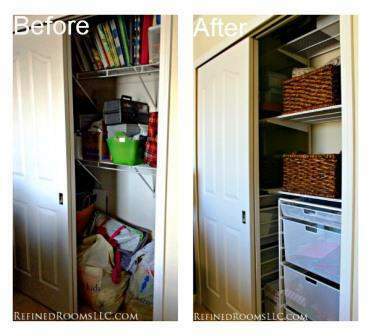 Got a closet makeover in your future? Which room is it in?